The 2017 Global Fortune Forum will be held in Guangzhou on December 6-8. Vice Premier of the State Council Wang Yang will attend and deliver a keynote speech at the opening ceremony. On the sidelines of the Forum, Vice Premier Wang Yang will meet with Prime Minister Justin Trudeau of Canada and Prime Minister Peter O'Neill of Papua New Guinea who are also participants of the Forum. Vice Premier of the State Council Liu Yandong will visit the UK and co-chair the 5th Meeting of the China-UK High-level People-to-people Dialogue with UK Secretary of State for Health Jeremy Hunt on December 4-7. In the UK, Vice Premier Liu Yandong will meet with the British government officials and members of the Royal Family, and sign the Joint Statement for the 5th Meeting of the China-UK High-level People-to-people Dialogue as well as cooperation documents covering the relevant fields. We believe that this visit will further consolidate political mutual trust between the two countries, enrich people-to-people exchanges and cooperation, and advance China-UK relations in the "golden era". Q: Today, the Australian Attorney-General told parliament that there will be some new laws introduced this week to strengthen investigation and persecuting acts of espionage. The Australian intelligence agency has some concerns about Chinese people's interference in the political process there. Does China have any comment? A: China develops its friendly relations with other countries on the basis of mutual respect for sovereignty, territorial integrity and non-interference in internal affairs. 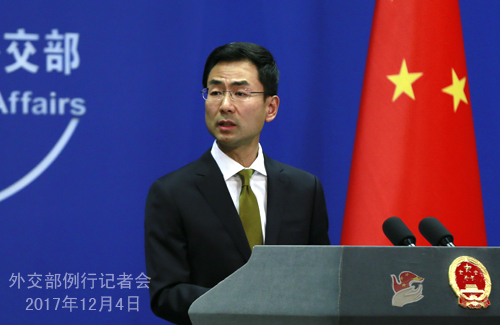 China does not interfere in other countries' domestic affairs. We urge the relevant people in Australia to discard prejudice and speak and act more in a way that will be conducive to boosting China-Australia relationship and deepening cooperation between them. A sound and steady China-Australia relationship serves the common interests of both sides. Q: The US and the ROK will hold their joint air force exercise "Vigilant Ace" on December 4-8. What is your comment? A: The situation on the Korean Peninsula is highly sensitive. We hope all relevant parties take more actions that would help ease tensions and refrain from provoking each other. Q: According to the Japanese media, the mayor of the city of Ishigaki, in Japan's Okinawa Prefecture, plans to submit a proposal to the city assembly on December 4 to change the name of an area currently known as "Tonoshiro, Ishigaki City" to "Tonoshiro Senkaku, Ishigaki City". What is your comment? 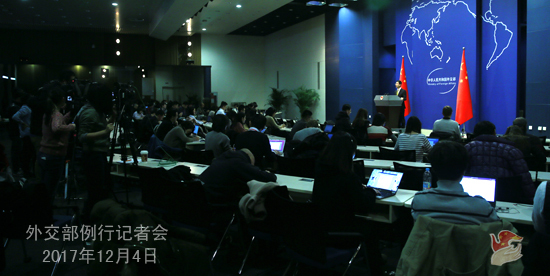 A: The Diaoyu Island and its affiliated islands have always been an inherent part of Chinese territory. China's determination to safeguard its territorial sovereignty remains unshakable. Whatever tricks the Japanese side may like to play, they cannot change the fact that the Diaoyu Island belongs to China. We urge the Japanese side to face this history and fact squarely, stop using this issue to make trouble, and avoid sabotaging a burgeoning positive momentum in the bilateral relations. Q: Port Qasim coal-fired power plant built under China-Pakistan Economic Corridor (CPEC) was inaugurated last week. Speaking on the occasion, Chinese Ambassador to Pakistan said involvement of Qatar in the project reflects political willingness of China and Pakistan to have peace and stability in region. He hoped other countries would also join CPEC soon. What is your comment? A: Port Qasim coal-fired power plant is an important energy project under the CPEC. The Chinese side is pleased with the power plant being officially put into operation. We believe that this will play a positive role in alleviating power shortages in Pakistan and benefit the Pakistani people. As the first project under the CPEC with the participation of a third party, it demonstrates the openness of this initiative. 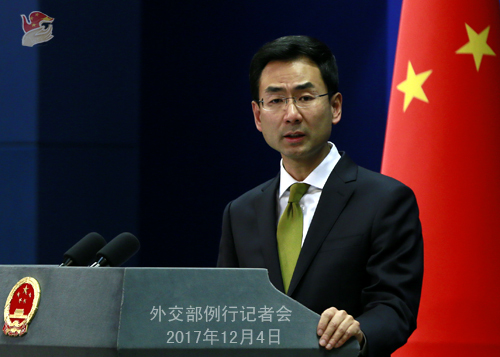 On the basis of reaching consensus with the Pakistani side, China would like to explore the possibility of more countries participating in the CPEC. Q: Pope Francis said that he would like to pay a visit to China, the second time at least in a year that he made such a comment. Is China ready to invite him for a visit? Pope Francis also said that the current negotiation between Vatican City and China involves political dialogue. What can you tell us more about that? A: Just like what I have said many times, China's position on China-Vatican relations is consistent and clear. China would like to continue with constructive dialogues with the Vatican side in accordance with the relevant principles and move forward the improvement of relations between them. Q: Two congressmen in the United States have said that the Pentagon is looking to potentially increase anti-missile defense systems on the US West Coat. Is China nervous about a potential build-up of anti-missile systems like THAAD further on the US West Coast? First, we keep stressing that the situation on the Korean Peninsula is highly sensitive. We hope that all relevant parties exercise restraint and act in a way that could help easing the tensions on the Peninsula. Second, on anti-missile system, China's position is very clear. Since the anti-missile issue concerns the global strategic security, stability and balance, we hope that all parties could approach this issue in a responsible and prudent way. Q: China and Japan agreed to hold the 8th round of the High-level Consultation on Maritime Affairs within this year. Have you nailed down the time, location and topics for the Consultation? A: As agreed by the two sides, the 8th round of the China-Japan High-level Consultation on Maritime Affairs will be held in Shanghai, China on December 5-6. Officials representing foreign ministries, defense ministries, marine law enforcement and management departments of both sides will attend the talks. Q: Iran has inaugurated the first phase of the Chabahar port on December 3, which is widely regarded as a rival to the Gwadar port being developed by China because of proximity. It also provides a direct way for India to transport goods to Afghanistan. And coinciding with the inauguration, India, Iran and Afghanistan also signed an agreement granting preferential treatment in tariff reductions to Indian goods headed towards Afghanistan. How does China view this? A: We are glad to see regional countries maintain friendly relations and conduct mutually beneficial cooperation. We hope that such cooperation will contribute to regional peace, stability, development and prosperity. Q: What do you expect from Canadian Prime Minister's visit to China? A: Last week we announced the visit by Canadian Prime Minister Trudeau. China and Canada are all major countries in the Asia-Pacific region, sharing a wide range of common interests and broad cooperation platforms. Facing important opportunity for further development, China-Canada relations are moving ahead with a sound momentum. There have been frequent exchanges at various levels, positive progress in all-around pragmatic cooperation, and adequate communication and coordination on international and regional issues between the two sides. China attaches high importance to developing its relations with Canada. Taking this visit as an opportunity, we stand ready to work with the Canadian side to enhance political mutual trust, deepen practical cooperation, expand people-to-people and cultural exchanges on the basis of mutual respect, equality and mutual benefit, and move forward the China-Canada Strategic Partnership.